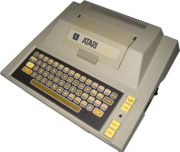 Computer from Atari. Announced in December, 1978. Released in October, 1979. Discontinued in November, 1983. Codenamed Candy during development.